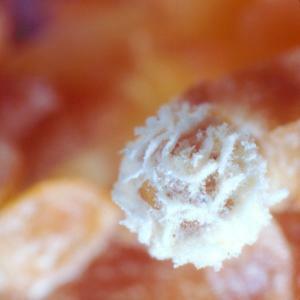 A male flower of Balanophora fungosa at very high magnification. Out of focus are a few of the brown petal-like structures. The white globe consists of the structures bearing pollen, the anthers, which have opened and look like papery scales. With a little imagination, you can see white pollen grains among those scale-like structures.